KNOM has been honored with the 2003 Gabriel Radio Station of Year Award! This is the eighth year in a row that our mission has won this top honor. Please give yourself a well-deserved pat on the back for helping to make our work possible. If you would like to attend the awards ceremony in St. Louis on Saturday, October 18th, please contact KNOM manager Tom Busch immediately. We thank you sincerely for your support and your prayers. PICKY, PICKY: (left) KNOM’ers harvest the bounty of the late summer tundra. 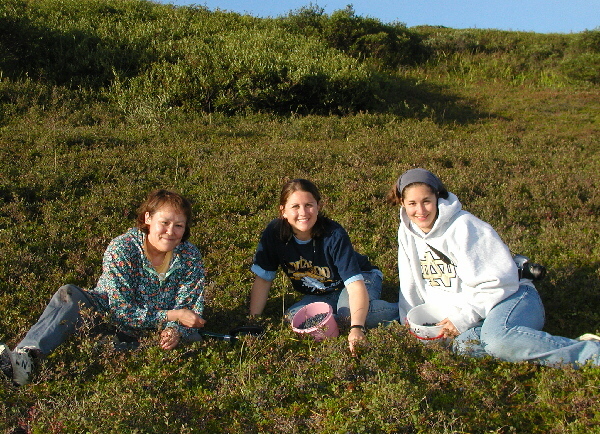 From left, business manager Florence Busch and volunteers Amy Flaherty and Anna Dummer pick wild blueberries on a hillside about ten miles from Nome. The berries have been an important source of Vitamin C ever since the first humans came to Alaska thousands of years ago. The season may last a week or two, during which an experienced picker can collect several gallons of berries a day. These days, they’re carefully frozen, to provide nutritious fruit year-round. MOVING: KNOM listeners were touched in late August by a lengthy conversation with Martin Oktollik, the mayor of the village of Point Hope. Oktollik spoke of his 30-year dependence on alcohol and drugs, and his recovery from it. It’s estimated that about 14% of Alaskans abuse alcohol. That’s the highest in the United States, about twice the average. It’s one of the horrors in western Alaska that our mission battles. STEEL YOURSELF! $22,480.10 was our final bill for the thorough rebuilding and maintenance on our 33-year-old tower in June. If you or someone you know could help out, we’d be very grateful. Thank you for supporting KNOM, the oldest Catholic radio station in the United States. INSPIRATIONAL SPOT: We tend to think of prayer as a religious obligation. To Jesus, prayer was a necessity, like eating and drinking. It didn’t bring him material goods, it didn’t spare Him from heartache and suffering. Not one time did he ask the Father to give Him anything. Jesus regarded prayer as a necessity that should be practiced continuously and persistently. IT’S NEWS TO US: (left) KNOM news director Paul Korchin has forty-nine minutes to prepare for his next hourly newscast at 10:55 AM. Weekdays, we air five minutes of state and regional news throughout the day, plus AP Network News at the top of the hour. 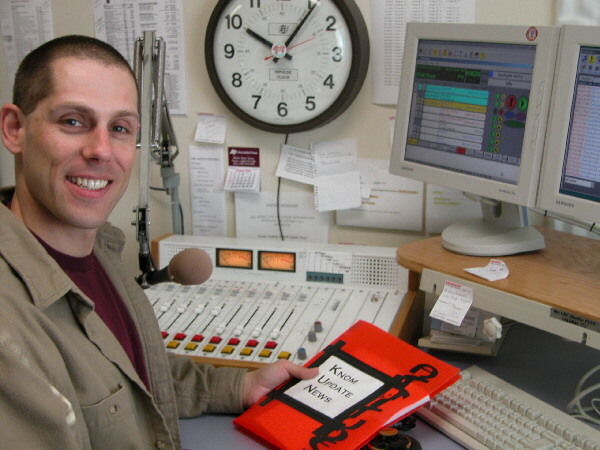 A KNOM volunteer in 1988 and 1989, Paul returned to the station as salaried news director in 1998. Under his guidance, the already-strong news department has prospered, providing western Alaskans with day-to-day news, as well as information on the many issues facing this region. Few KNOM listeners are aware that Paul holds a PhD. from Harvard University in Biblical and ancient Middle Eastern studies. As we write this, Paul is preparing to teach a college course on the origins of written language during the fall semester. When he’s not working on scholarly papers, you’ll find Paul four-wheeling around the area, or working out at Nome’s gym. He’s a valued asset to the KNOM mission and we thank him sincerely for the sacrifices he makes to provide village Alaska with complete, accurate accounts of the vast area’s goings-on. DISHING IT OUT: In August, two technicians from the Associated Press’ Seattle bureau came to KNOM to tweak our satellite dish, at no cost to us. Because Nome is so far north and west, AP’s signal is extremely weak and occasionally fades. They returned home with several ideas how they might improve our reception. BACK IN THE SADDLE: We welcomed 2001-2 KNOM volunteer Ryan Conarro, visiting Nome after a year on a national theater tour performing in “A Midsummer Night’s Dream” and “The Importance of Being Ernest.” We, of course, put him right to work! KNOM broadcasts into dozens of Eskimo and Athabascan Indian villages throughout 100,000 square miles of isolated western Alaska, and well into Russia, too, with inspiration, education, news and positive companionship, 24 hours a day, thanks to you. INSPIRATIONAL SPOT: Hard times are the grit that heaven uses to polish its jewels. INSPIRATIONAL SPOT: Have you ever tried to make sense of a tragedy? How can you help? What can you say or do? Your job is not to take away the hurt, but to be present with love. CLEAN POLITICS: This summer, while touring Nome and area villages to learn about the dire health needs of this remote region, U.S. Health and Human Services Secretary Tommy Thompson leaped into the Bering Sea. Thompson had heard of Nome’s annual Polar Bear Swim. At midnight, he dragged Nome mayor Leo Rasmussen out of bed to serve as official witness. RECENTLY HEARD: Recently over KNOM, you’d hear discussion of topics such as firefighting, Native dancing, cultural ties between Alaska and Russia, efforts to end drunk driving, alcoholism among Alaska Natives, fish and game issues, and educational summer camps for kids, among many others. Thank you for helping us to bring these important subjects into thousands of village homes! (Left) Meet KNOM listener RITA OYOUMICK (pronounced eye-YOO-mik), who lives in the village of St. Michael, 130 miles SE of Nome. 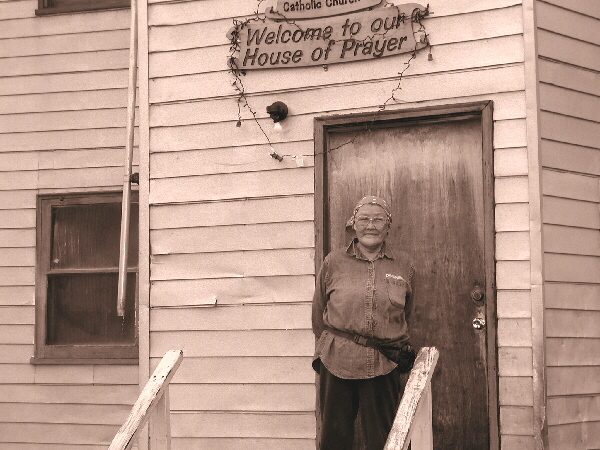 Rita, posing in front of the village’s St. Michael church, volunteers for the parish. In the absence of a resident priest, she maintains the building, pays the bills, conducts prayer services, and funerals, and is even supervising construction of the parish’s new church, which is being hammered together by other volunteers. Please consider remembering missions like KNOM in your will. For many of us, it will be the largest gift we will ever make. We prayerfully place all bequests into funds that provide for major future improvements, and protect the KNOM mission from unforeseen emergencies. INSPIRATIONAL SPOT: The strong hands of Jesus sawed, carved and pounded. He built things for a living, this quiet and gentle carpenter’s Son. On the Cross, He built one final thing for us, a bridge to His Father’s house. INSPIRATIONAL SPOT: An apology is a great way to get the last word. 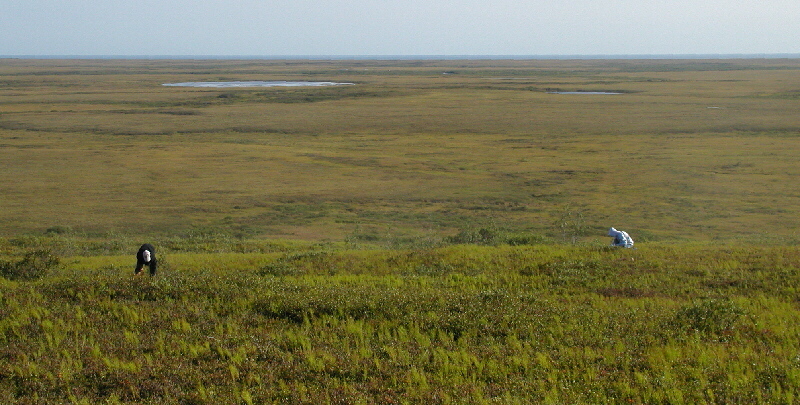 GOD’S BERRY FARM: (left) KNOM volunteers pick low-bush blueberries on the tundra west of Nome. The Bering Sea is a thin gray line on the horizon about six miles distant. When you’re out in the wilderness, it’s important to keep your eyes open. Wild blueberries are a major source of nutrition for the region’s many grizzly bears, who do not like to share. SERIOUS BUSINESS: In September 1993, the KNOM mission adopted the Diocese of Fairbanks’ strict policies against sexual misconduct. Since then, all staff have undergone formal training, so that they can recognize sexual misconduct should it occur, and report it to authorities. “We take this extremely seriously,” says general manager Tom Busch. “In the fifteen years since I have been in charge of KNOM, I am not aware of a single improper incident." You remain our strength, and we appreciate your kindness and your support immensely. We pray for you and your intentions at every weekly staff meeting, and in our personal prayers, too. Thank you! May God bless you abundantly. INSPIRATIONAL SPOT: Oh, Lord, in my present need, help me believe that You are aware of my anxiety, and will do what is best for me. Give me the strength to trust You and put the present and future into Your merciful hands. INSPIRATIONAL SPOT: Dear Lord, teach me to be generous; teach me to serve You as You deserve; to give and not count the cost; to fight and not heed the wounds; to labor and not ask for reward, save that of knowing that I am doing Your Will. Amen.